Even if you have already had to bite the bullet and take out loans to pay tuition, that doesn’t mean you have to finance your entire 4 years with debt. You can still find ways to minimize the debt or even avoid it altogether. It takes a little creativity and sacrifice. But that’s what your college years are for! So here are 5 tips for graduating with the smallest amount of debt possible. Working while studying is becoming more and more common these days so you won’t have too much trouble finding an employer willing to work around your class schedule. And a part time job can bring in enough money to cover your living expenses. So by working part time, you can avoid thousands of dollars in debt because you aren’t adding 4 years of living expenses to your tab. And beyond that, there are some employers that even offer education benefits. These employers will pay part (or sometimes all) of your tuition in addition to paying you wages. So if you find the right employer, you could not only save on living expenses but you could even decrease the amount of debt you’re taking for tuition! Do your research and ask about education benefits in your interviews. While at college, you are going to see too many students driving cars and renting apartments they can’t really afford. They buy the name brand groceries. They get the newest electronics. They go out way too often. Don’t be that student. Get a used car. Buy a reliable used car with cash. Don’t take out a loan to drive a new car. You’re a student. You have no reason to be driving a new car. Better yet, you could be using public transport and avoid all the expenses of owning a car like insurance, gas, maintenance, parking fees, and so on. Live with roommates. This will save you hundreds every month. Skip the TV. Just watch movies and TV shows on your computer. Buy generic. Get the generic brands of all your foods. Get canned or frozen produce so that it doesn’t spoil before you eat it. Invite people over instead of going out. Buying some snacks and drinks to enjoy at home with friends is much, much cheaper than going out to a restaurant or club. It’s also just as fun. And they’re broke to so you’re helping them out. There’s a lot of ways to avoid spending money. In 4 years, you will be thanking yourself. When making your monthly budget, don’t include your credit card limit as part of your “available money” for the month. Budget as if you were living purely on cash. Credit cards should exist to get you through an emergency. You shouldn’t go into debt to cover your normal expenses. So if you can’t afford it without using credit cards, you need to rethink your budget and start making some cuts. In fact, you shouldn’t even be carrying your credit card in your wallet. Keep it in a drawer in your room. Don’t touch it unless you absolutely need it. If that advice sounds too tough to follow, please refer back to tip #2! If you’ve already cut everything from your budget that you possibly can, look for creative ways to earn more money before you go into debt. 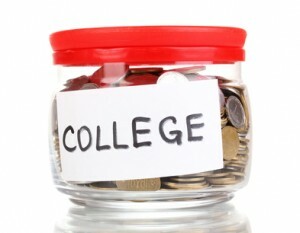 Many people know that they should apply to scholarships and financial aid before they start college. But did you know that you can keep applying even after you’ve already started? 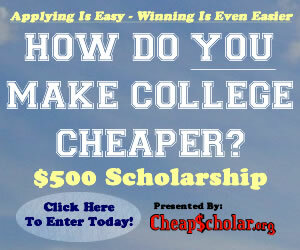 There are plenty of scholarships out there that are available to students who have already begun studying. Make a habit of checking and applying to scholarships, grants, and other sources of financial aid. Set aside an afternoon or evening once a month to scour the web and apply for everything you can. It’s a numbers game. If you apply to hundreds of different scholarships throughout the year, you’re bound to actually get a couple. And even if they don’t cover everything, they will make a dent. And remember that every dollar you can take off of your total student debt is worth more than a dollar in the long run. That’s because the smaller your principal amount is, the slower the interest on that amount will grow. After a year of studying and stressing over finals, it can be tempting to use your summers to relax and recuperate. That’s especially true if you work part time during the year. But imagine this: if you worked full time during the summer months and saved up the majority of that money, you could potentially save yourself from having to work during the school year. At the very least, you could save enough to cut your hours or allow yourself to splurge on a few “luxuries” like that name brand cereal you love. Heading off to college can feel like your first taste of freedom and adulthood. But you have to realize that with that freedom comes responsibility. You can’t keep digging deeper into debt just to pay for things you don’t need. You will have to pay for it later, literally! Ensure that you have a solid, debt-free (or low debt) start to your actual adulthood after college by practicing the tips above and other smart money management practices! Today’s guest article comes from Kostas Chiotis, an economic blogger with a keen eye for personal finance. 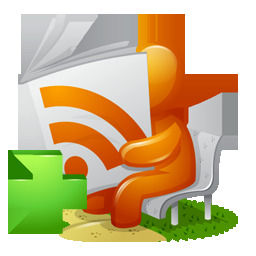 You can find more of his articles at FinanceBlogZone.com and follow him on Twitter or Facebook.